Over the years Joe Abercrombie has earned a reputation as one of fantasy's most exciting and popular writers. His novels have sold more than a half million copies while receiving rave reviews. 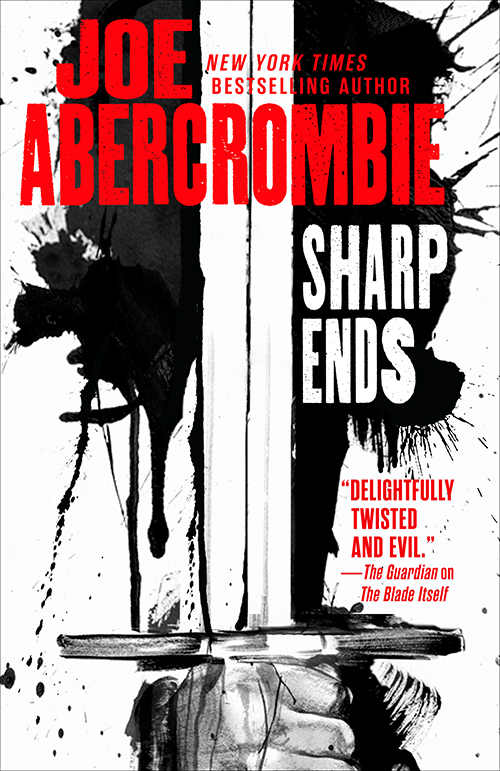 But Abercrombie is also an accomplished writer of short fiction--something we've noted on several occasions. Indeed, Tia called the story "Tough Times All Over," from the Rogues anthology: "fun and funny...fast paced and gripping," while Zhaoyun characterized "Some Knockout" as "positively delightful" and "a nonstop barrage of Abercrombie's characteristic bleak situations + wry humor one-two punch." I’m very pleased that some widely scattered shorts are going to be brought together in one volume along with some new stories about old friends and enemies, filling in some blanks in the map of the First Law world and offering some different perspectives on key events. I hope readers will have as much fun revisiting some of these much-loved–and much-hated–characters as I have. Shy gave the horse her heels, its forelegs buckled, and, before she had a notion what was happening, she and her saddle had bid each other a sad farewell. She was given a flailing instant aloft to consider the situation. Not a good one at a brief assay, and the impending earth gave her no time for a longer. She did her best to roll with the fall—as she tried to do with most of her many misfortunes—but the ground soon uncurled her, gave her a fair roughing up, and tossed her, flopping, into a patch of sun-shrivelled scrub. She stole a moment just to get some breath in. Then one to groan while the world stopped rolling. Then another to shift gingerly an arm and a leg, waiting for that sick jolt of pain that meant something was broke and her miserable shadow of a life would soon be lost in the dusk. She would’ve welcomed it, if it meant she could stretch out and not have to run any more. But the pain didn’t come. Not outside of the usual compass, leastways. As far as her miserable shadow of a life went, she was still awaiting judgment. Shy dragged herself up, scratched and scuffed, caked in dust and spitting out grit. She’d taken too many mouthfuls of sand the last few months but she’d a dismal premonition that there’d be more. Her horse lay a few strides distant, one foamed-up flank heaving, forelegs black with blood. Neary’s arrow had snagged it in the shoulder, not deep enough to kill or even slow it right off, but deep enough to make it bleed at a good pace. With her hard riding, that had killed it just as dead as a shaft in the heart. There’d been a time Shy had got attached to horses. A time—despite reckoning herself hard with people and being mostly right—she’d been uncommon soft about animals. But that time was a long time gone. There wasn’t much soft on Shy these days, body or mind. So she left her mountto its final red-frothed breaths without the solace of her calming hand and ran for the town, tottering some at first, but quickly warming to the exercise. At running, she’d a heap of practice. “Town” was perhaps an overstatement. It was six buildings, and calling them buildings was being generous to two or three. All rough lumber and an entire stranger to straight angles, sun-baked, rain-peeled, and dustblasted, huddled about a dirt square and a crumbling well. The biggest building had the look of a tavern or brothel or trading post or more likely all three amalgamated. A rickety sign still clung to the boards above the doorway but the name had been rubbed by the wind to just a few pale streaks in the grain. Nothing, nowhere, was all its proclamation now. Up the steps two by two, bare feet making the old boards wheeze, thoughts boiling away at how she’d play it when she got inside, what truths she’d season with what lies for the most likely recipe. There’s men chasing me! Gulping breath in the doorway and doing her best to look beyond desperate—no mighty effort of acting at that moment, or any occupying the last twelve months, indeed. Three of the bastards! Then—provided no one recognised her from all the bills for her arrest—They tried to rob me! A fact. No need to add that she’d robbed the money herself from the new bank in Hommenaw in the company of those three worthies plus another since caught and hung by the authorities. They killed my brother! They’re drunk on blood! Her brother was safe at home where she wished she was, and if her pursuers were drunk, it would likely be on cheap spirits as usual, but she’d shriek it with that little warble in her throat. Shy could do quite a warble when she needed one, she’d practiced it ’til it was something to hear. She pictured the patrons springing to their feet in their eagerness to aid a woman in distress. They shot my horse! She had to admit it didn’t seem overpowering likely that anyone hard-bitten enough to live out here would be getting into a sweat of chivalry, but maybe fate would deal her a winning hand for once. It had been known to happen. ...and while you're at it, check out Orbit's call to adventure.